Soil Stabilization | Houston, TX - FIRST MATERIALS & TECHNOLOGY, INC.
Great buildings start with great soil. Call FIRST MATERIALS & TECHNOLOGY, INC. for high-quality soil stabilization and remediation products. We provide state-of-the-art soil stabilizers and remedial materials that are blended to the specifications of engineers and contractors. Our products offer the most efficient solutions for all types of soils. They are formulated to ensure optimal building conditions and greatly increase the stability of any foundation against future settling problems, potholes, and cracks. With our efficient delivery service, effective dust-reduction techniques, and technical information sources, we are truly the best choice for soil stabilization and environmental remediation. Order soil stabilization products for your construction site. For more than three decades, FIRST MATERIALS & TECHNOLOGY, INC. has supplied soil stabilization and environmental cleanup materials to the building, construction, and environmental industries. Our founder, Charles R. Miller, created and patented a variety of legendary scientific and engineering products that are widely used in the industry and have excellent track records. 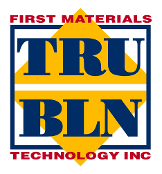 TRU-BLN® is our flagship soil stabilization blend. We are proud of our reputation for high-quality control standards and exceptional customer service. Our team addresses your specific job requirements individually paying close attention to detail in order to ensure that your needs are met. Qualified job supervisors are available to attend to any special trucking or delivery needs.